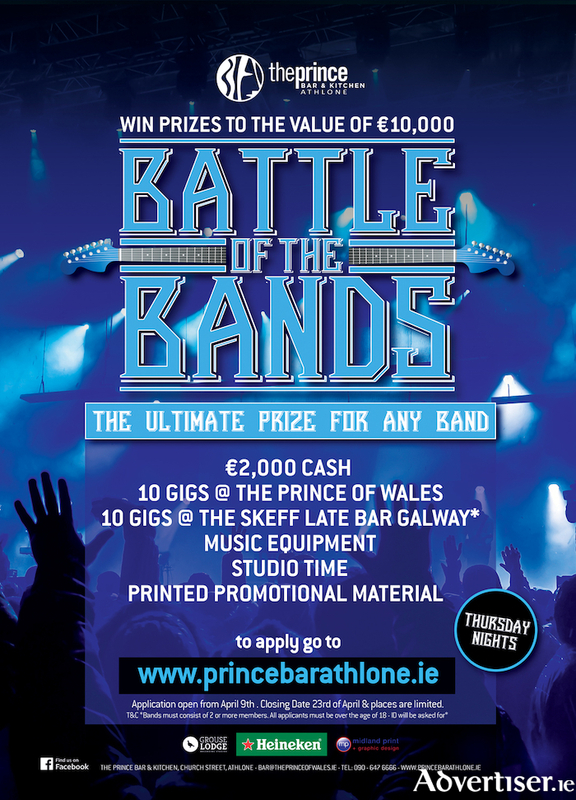 Advertiser.ie - Battle of The Bands Commences THIS THURSDAY!! Get Ready! Battle of the Bands kicks off this Thursday night (May 17th ). Over the next month, unsigned bands will take to the stage at The Prince Bar, Athlone and perform live for your vote. This is an excellent opportunity for up & coming bands to win a coveted prize fund worth €10,000. Three bands will compete in each battle with one emerging through to our Semi-Final in June. The winning band will be chosen by the result of a judge & audience vote. The amazing prize fund consists of €2,000 cash, paid gigs in Athlone & The Skeff Late Bar in Galway City, music equipment, studio time & promotional material. Heineken, Grouse Lodge & Midland Print have all come on board as sponsors for this exciting event. Our first band will take to the stage at 10pm for approx. 30 minutes, immediately followed by our 2nd & 3rd competing bands. A great night of entertainment & talent is guaranteed throughout this entire competition. Come along and vote for your favourite. Voting cards available on entry. For any more information see social media, princebarathlone.ie or contact 090 647 6666.